Geosite	Poulnabrone	Situated on the high Burren limestone plateau, Poulnabrone Dolmen is one of Ireland’s most iconic archaeological monuments and is the second-most visited location in the Burren, after the Cliffs of Moher. It is the oldest dated megalithic monument in Ireland. 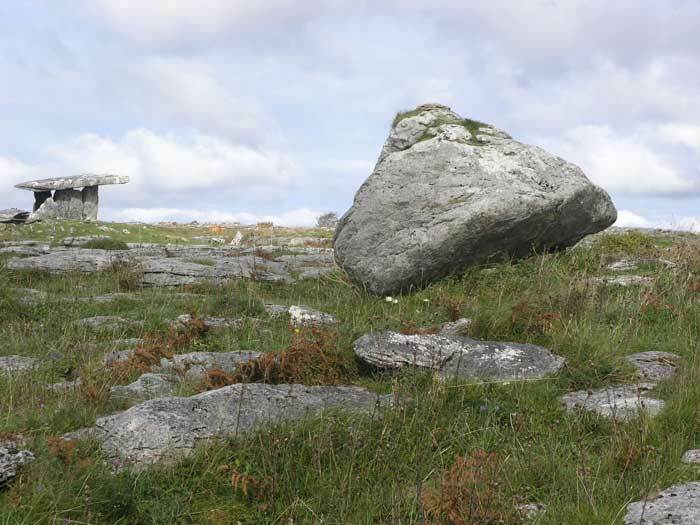 Situated on the high Burren limestone plateau, Poulnabrone Dolmen is one of Ireland’s most iconic archaeological monuments and is the second most visited location in the Burren after the Cliffs of Moher. It is the oldest dated megalithic monument in Ireland. Poulnabrone is classified as a portal tomb. Portal tombs have two large portal stones standing on either side of an entrance capped with a massive sloping capstone. A second stone which lies on the ground at the rear of the monument was likely a second capstone which would have fitted in under the main capstone and covered the back of the structure. This part collapsed at some unknown time in the past. 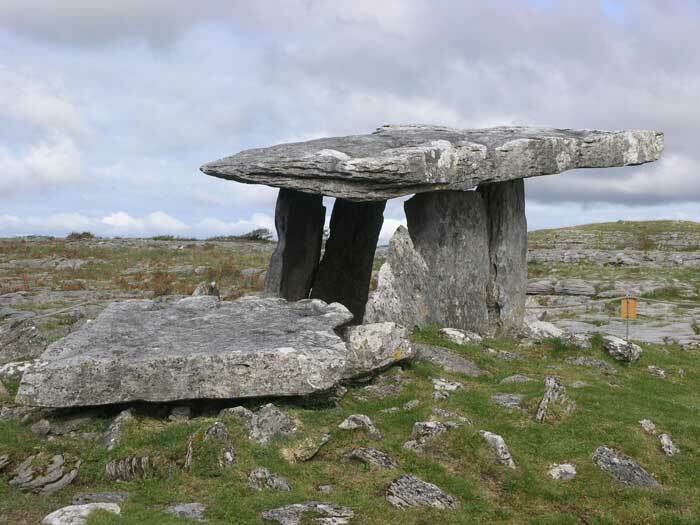 The tomb was built on limestone pavement and surrounded by a low mound of rocks. This mound of rocks would have added support to the upright stones which are otherwise only supported by the weight of the capstone. The uprights are not wedged into the deep fissures which are common in the limestone. The limestone flagstones which were used to build the monument would have been extracted from the surrounding limestone pavement. Excavations by archaeologist Anne Lynch in the 1980’s revealed the remains of 21 people in the main tomb chamber and radiocarbon dating of their bones indicates that the tomb was in continual use for a period of 600 years between 5,200 and 5,800 years ago. The bones show signs of wear that suggests hard physical labour was normal for the people of the time and while one hip bone had the tip of an arrow head embedded in it indicating conflict, there is also evidence of creativity and craftsmanship shown in the discovery of a decorated neck pendant. Glacio-karst landscape features, which are the combined result of glacial activity and rainwater dissolution features, are abundant around Poulnabrone Dolmen. The limestone pavement has been scraped clean by moving ice sheets and the blocks of limestone known as clints are separated by fissures known as grikes. The grikes are formed by rainwater dissolving thin calcite veins that permeate the limestone. While the last ice sheets melted here almost 16,000 years ago and the karst process has been active since then, there is evidence that karst processes were operating in warmer interglacial periods before the last ice age. The large boulder that lies beside the path to the dolmen is an example of a glacial erratic. Large boulders like this are scattered throughout the Burren and they were deposited here as the last ice sheets melted. They were originally ripped up as the massive ice sheets moved over the land and scoured the surface. 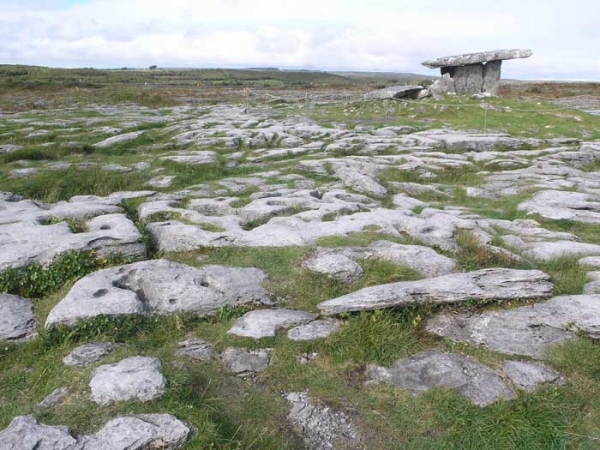 While many of these boulders have come from the Burren, other granite and sandstone erratics have been carried here from Galway and east Clare.